Get drawn into the hypnotizing play of rich green hue in the beauty of Russian Diopside. Flaunting a uniquely appealing colour, the richness of its dazzle calls to all the appreciators of exotic gemstones. Sourced from the rigid frosts of Russia, the stone is rare, unique, and one of the newer gems in all the fronts that matter. Despite what a number of people claim and maintain, this gemstone is one hundred percent naturally-occurring and is found in the same charming manner as it is presented. Considered as one of the rarer varieties of diopside, this stone made its first appearance somewhere in 1988. 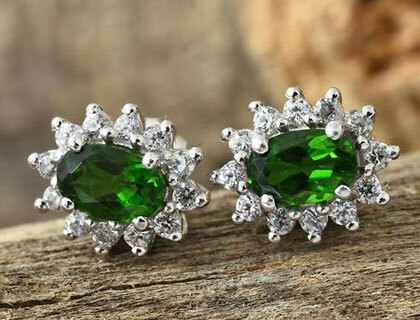 First spotted in Siberia, Russia, it is the part of the family of chrome diopside. Large deposits were later found in Pakistan, which is also a famous supplier of the said gem. Ever since its introduction to the market, its colours have been compared to the intense tones of emerald. It was placed in comparison with tsavorites and tourmalines. However, upon the procurements of large quantities of this gem in mining, the price of it was notably reduced. It is why that Russian diopside is rare but it is an affordable and modestly priced gemstone. There are several places around the world from where the jewel is mined. That said, the most consistent and promising quality is mined from Inagli, Siberia, Russia. Other major locations where you can find the mines are Pakistan, Sri Lanka, South Africa, Brazil, Italy, North America, and Finland. Not many can stop raving about the brilliant intensity of the green colour that the stone flaunts. Looking magnificent, the stone is, in fact, easily distinguishable from other green stone gems like emeralds, tourmaline, et cetera. That’s because its composition is different as well, and is made in the igneous and metamorphic rocks. Another thing that was noted about the stone was that the intensity of it increased with the carat weight, up to an extent that bigger stones didn’t reflect a glow as majestic as the smaller ones. It’s a main reason why you will usually only find smaller carat weights and cuts for the stone. Another thing to note about Russian diopside is that it only rates 5.5 on the Mohs scale of hardness. This implies that it is a relatively softer stone in comparison to the other crystals. You ought to take special care of it as it is easy to break or crack, which would affect its sparkle. Named Russian emerald, the feature that makes the stone so prized and coveted is its lush colour. Speaking of the clarity of it, it shows no visible inclusions after being polished. In fact, another reason why it is so sought-after is because it varies from transparent to slightly translucent in appearance. The lustre of the stone, on the other hand, is all-encompassing. It steals the breath of the admirers and makes the stone maintain its position in the market. Considering that it is a relatively new addition to the world of gems, there have not been many stories associated with it. There have been legends claiming that the stone fell from the sky, which constituted as one of the reasons why it was buried with the dead to guide them to heaven and aid in renewal of life. Some cultures believe that the colour green holds the power of earth, and so the healers place it on the head of the people suffering from the lack of a peaceful sleep or anxiety. Other properties that plenty healers claim are that it is the stone used to ward off evil and malicious spirits. The name also has a lot of meaning and stories attached to it. The term “diospide” can be understood as “di,” meaning two and “opsis,” meaning vision. This meaning entails that the stone holds the power to heighten your intellect, psyche, and awareness. Some people also believe that the gem can help alleviate aggression as well as stubbornness. The same people believe that it heightens the emotions, making the bond of love and commitment more holy. It has already been established that the stone rates pretty low on the Mohs scale of hardness. It means that Russian Diopside isn’t a particularly strong stone. Therefore, it is important that you treat it with the respect and care that it deserves. It also means that the gem is prone to damage if it is one the receiving end of a harsh blow. When it comes to cleaning the stone, you can wash it under a running stream of cool water. If there is persistent grime or dirt found on the surface, you can soak the stone in a bowl of warm water along with a few drops of dish-soap. Rinse it with cool water and wipe with a soft towel or chamois cloth. You should also remember not to treat it with ultrasonic or steam cleaners as they will cause damage to the gem’s shine. Russian diopside borrows its name from the place of its origin and the location of its mine. The best and the most consistent quality is found in Siberia. It flaunts a rich green colour, which is eerily similar to other stones like tourmaline and tsavorites. However, it is cheaper as compared to the other stones. It is a relatively newer stone in the market and was introduced somewhere in the year 1988. There are a lot of stories attached with the stone, owing to its green colour. Many people believe that it holds the power of earth.